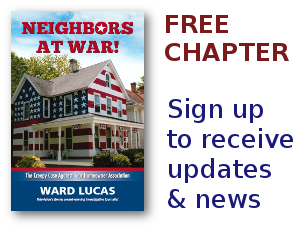 HOA residents Archives - Neighbors at War! 1. Create as many rules as you can, the pickier, the better. a. Be sure to create rules in closed session rather than an open meeting. b. Optional: provide an announcement of the new rules only AFTER you have put them in effect. Then ignore any objections. c. Rules created hastily as a knee-jerk reaction are guaranteed to cause maximum conflict. 2. Be inconsistent about enforcing the rules. a. Allow friends and family to break rules. They will help you stay in power. 93 years old, living in the wilderness, splitting wood, and making violin bows. Will that be you? Or me? Jack English has loved the wild areas of California since he was a young boy. And his wife’s dying words and his sentimental heart led him back there with plans to stay until the end. Jack mades me think of Dorothy. She lived in my HOA. When it was discovered the audits had not been done, and $10,000,000.00 was unaccounted for, and the bills weren’t paid, and the houses were rotting before our eyes, Dorothy invited me in for a talk. She was 93, frail, but with fight in her eyes. In my mind’s eye, I can still see her sitting there in the power blue velveteen chair with her walker at arm’s length. Her eyes were locked with mine. As the tears ran down her cheeks she said, “Nila, if I was younger I would be fighting as hard as you are to get to the bottom of this, but I’m too old and too weak. Something sinister is going on here; you know it and I know it. If you don’t get this mess straightened out, I am going to figure out a way out of here! I don’t want to spend another day of my life in this horrible nightmare of a homeowners association.” Sadly, Dorothy ended up in a nursing home and not long ago I read her obituary. It still makes me sad to think that Dorothy, at nearly a century old knew she was being ripped off, but she was helpless. She could be nothing more than a victim and hand over her money every month. It’s really refreshing to see Jack English’s story. Knowing he was one elderly person who didn’t get caught in some HOA maintenance-provided propaganda sales pitch like so many other 80 and 90 year olds. And, it’s a reminder that when we fight these HOA battles it is not just for ourselves. It’s for all the Dorothy’s across this country who have no clue that when they bought into an HOA they signed away their twilight years into a hellish nightmare like they have never known in the decades they’ve lived before. We must never forget that their silence doesn’t mean they are not fully aware of the corruption. Father Time has just weakened them enough to make them easy prey for the HOA monster. Now, take a look at what life at 93 and HOA-free can be! No Comments on Are HOAs Facist? Bill Fry, an officer with the Army National guard, was returning from fighting in Iraq. All of a sudden he learned his HOA, The Spring Lake HOA of Mineoloa, Texas, had filed a lawsuit against him and his family because they put up the swingset to keep his kids company while he was gone. It’s not an outrageous swingset. It’s not candy apple red and doesn’t flash with florescent colored lights. It’s just a nice wood and canvas politically correct swingset. But the officials at Spring Lake have gone apoplectic. They want it taken down, NOW!